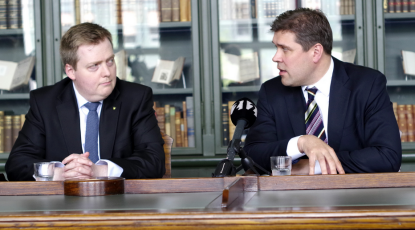 Yesterday the Icelandic government presented its first budget proposal of this election term. … in addition to the usual suspects, such as higher fees on alcohol/tobacco etc. So, yeah. Not exactly stellar. The most contested among these is undoubtedly the new fee for inpatients – for the first time people must pay for each night they spend in hospital, a charge of ISK 1.200. Which may be not such a huge deal for people who are working and relatively healthy, but which can be disastrous for chronically ill patients, to say nothing of the mentally ill. In fact, it is such a f*cked up notion that one begins to suspect whether they just stuck it in there so they can later remove it and hold that up as an example of their gentleness and compassion for the ill and infirm. No, really. You have to wonder. * Needless to say, perhaps, these are the folks who back the coalition parties financially. No, certainly not stellar and I do wonder …!? Sounds a bit like helplessness after lots of promises. Obviously, more austerity and no investment. RUV it seems wasn’t cut but gains modestly ? … and a tax (if legal?) on the old banks compensates for losses in the moguls’ fisheries taxes leaving me to wonder how the creditors will react. Sadly, it doesn’t sound helpless at all to me. It sounds cold and calculated and greedy. @Katherine one: Good question but I wouldn’t know the answer. Don’t try and smear them with Hákarl because all cats would decline. Ps. : What is a X-mas Cat anyway ? @Katherine two: Trust we agree. But once an “elite” turns democracy into a plutocracy into a cleptocracy only the people could send them to the Bastille. The paradox is that the people just voted for that same “elite”!? Ps. : We’d have to look at the Bastille because the new budget just put construction of a new prison on halth and cut the budget of the SPO. Jólakötturinn (“the Yule [Christmas] cat”)is the pet of the giantess/troll Grylla (the mom of the 13 naughty Yule Lads), a giant black cat. Grylla looks for children to eat; supposedly if one isn’t given at least one piece of new clothing for Christmas, you will get eaten by jólakötturinn. A couple years ago Jón Gnarr said he wanted to find the largest cat in Iceland to put on display in the Reykjavík Zoo at Yuletide as jólakötturinn. not that I expected anything better, though. Don’t forget the best part of it all, the are reducing fundings to the church (ISK 45 million a year) … !! @hildigunnur — you’re right, it was to be expected. But it’s still awful seeing it in print. Anything that helps the general populace and builds up society, that gets cut. Anything that benefits a rich-empowered few, that gets boosted. And people actually voted these robbers in. Sigh. Weep. Reducing funds to the church? I thought it was quite the opposite. That they were taking our money and giving to the church. Yes they are giving the church 45 millions more than before. Next post: Want to know how to publish your own book?